3 Years After Wreck, Remains Of Final Costa Concordia Victim Are Found : The Two-Way Workers at a salvage yard found remains believed to be of Russel Rebello, the last victim still missing after the cruise ship capsized in January of 2012. A Coast Guard patrols in front of the severely damaged right side of the Costa Concordia cruise ship after it was righted last week. 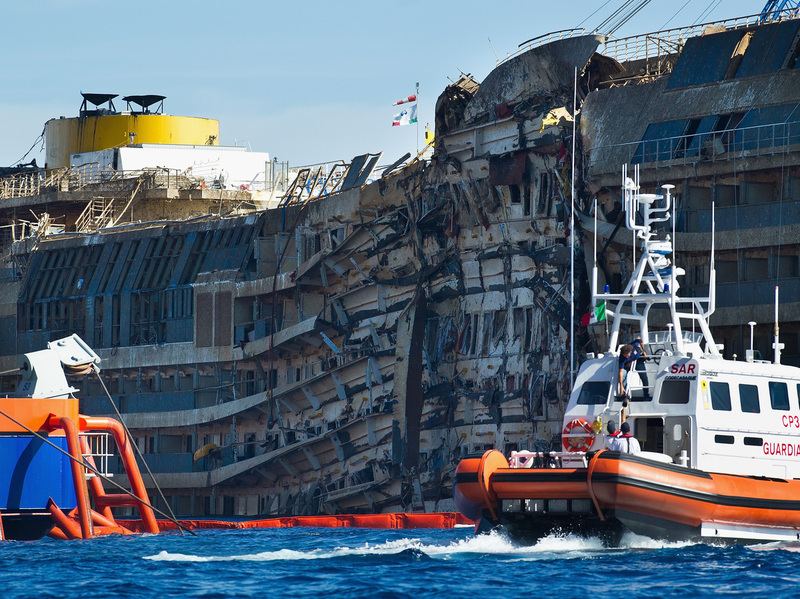 Workers at a salvage yard in Genoa, Italy, found the remains of the last victim still missing after the Costa Concordia capsized in January of 2012. The BBC reports the workers handed the remains over to authorities, who believe the remains belong to Russel Robello, a waiter who was working on the ship the day it ran aground. "Rebello's brother, Kevin Rebello, confirmed the news on Facebook. "'I promised my family that I will bring back home my brother some day,' Kevin Robello wrote, noting that 1,025 days had passed since the disaster. "Russel Rebello's body was found on Deck 8 in a cabin, his brother wrote. "'I don't have words to express,' Kevin Robello said. 'Just my pain, my tears, my heart pounding harder and my body trembling.'" The shipwreck off Tuscany left 32 passengers and crew dead. Costa Concordia's wreckage was moved from the harbor of the island of Giglio to Genoa this summer.